While planning for all the shopping, sightseeing and eating we are going to do on the trip, we forget to plan about the real risks involved, such as the loss of our passport and luggage, a natural calamity, or a medical condition. It is better that we plan and safeguard ourselves from such accidental threats and prepare beforehand. We bring to you the essential Travel Insurance Services. Operational from Ahmadabad, Gujarat, we are Hindustan Tourism Service. 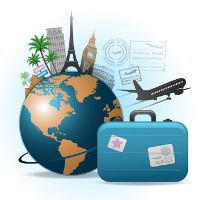 Let our professionals procure the most suitable travel insurance for you and your loved ones.